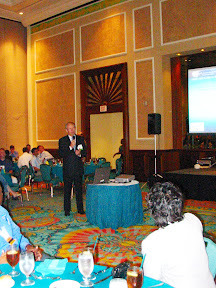 It's been a while since the enjoyable URISA 2006 Caribbean GIS Conference - the third in the "series" so far. URISA's busy staff promise the Proceedings will be available soon (delays due to customs/shipping), along with follow-up activities. The conference theme - Shattering Barriers ... Building Bridges - resonated with many, I believe. The spread of the Caribbean territories, along with the high cost of transportation and telecommunications within the region, dissuades communication, collaboration and cross-fertilisation between GIS practitioners. And the building of a Regional SDI that would allow the region to better tackle common problems such as Coastal Zone Management, Disaster Response and Crime. This isolation results in fewer initiatives by the region's countries themselves. As as one attendee shared with me later, there seems to be 'a reliance within certain countries on looking for outside funding (aid) before projects are started'. It's true. Many (not all) of the region's administrators are behind the curve when it comes to leveraging new technology. And so many countries seem to wait on impetus from outside to try GIS. For instance, the leading institution in the Anglophone Caribbean, the CARICOM Secretariat is yet to utilise GIS as far as I know (though an interested staff did participate in the URISA 2004 Caribbean Conference). E.g. CARICOM Protocol VII (deals with Competition Policy, Consumer Protection, Dumping and Subsidies), states awareness that the 'CSME may be frustrated by anti-competitive business conduct', and so notes the need for the Community to 'establish and maintain information systems to enable enterprises and consumers to be kept informed about the operation of markets within the CSME', and includes consideration of 'geographic context'. However, the jump to GIS to deal with what is obviously a spatial matter, seems yet to be made. CARICOM Statistics and other agencies will continue to do their good work, but without taking advantage of spatial information systems. CARICOM is preparing for the Year 2010 Round of Population and Housing Censuses (of CARICOM countries). Will GIS be utilised to store and (better) analyse these spatial data? Now there are quite a few islands of good example. Some literally, islands, like the Bahamas, USVI and the Caymans seem to have the high-level interest and support that should develop their SDIs. And the URISA conferences have showcased lots of excellent efforts in many countries. But, how can we roll these into a larger regional momentum? Well, to take the conference's theme to heart - build bridges between the bubbles of endeavour that exist. Bridges that allow the inspiration that is often sparked at events like the URISA conferences to be nurtured, critiqued, encouraged and brought to fruition. 'GIS is not easy to explain'. So, we (GIS people) need to explain it in different ways and to more people. Not just in technical settings. But in bars, in the media and (important) in schools. 'Data leads to information, leads to knowledge, leads to understanding, leads to decisions'. GIS practitioners routinely make the leap from data to decisions - it's what we're trained to do. But the people whose support we need, need to be tuned in to the knowledge and understanding parts. So, again ... in bars, in the media and (important) in schools. 'Solve problems; not sell technology'. Now, this hits the nail on the head. My little experience as a consultant ... and learning to recognise the look in the customer's eye as a gleam of interest or the glaze of boredom ... provided affirmation for me. But about those different bridges. This blog - via the team of authors - is meant to be one. Like to build the bridge to your place in the sun? It's actually quite easy to join the team and post articles such as this one. Please let me know. And you'll be posting your own take on matters GIS in no time. And look out for the initiative to start the URISA Caribbean Chapter. Valrie Grant-Harry will be leading this - more to come. For those ArcGIS fans - I'm sure most of you are - version 9.2 is now shipping. Read the press release here and check out what's new. From what I've read so far, it seems that this version is another evolutionary step forward for ArcGIS - bug fixes, some new features and better end user experience. Hopefully, I'll be using it soon and will post more on my experiences with it. I'm looking forward to ArcIMS 9.2, ArcSDE 9.2 and ArcGIS Server 9.2; the former 2 are the products I'm mostly using now but I'll like very much to start working with ArcGIS Server since I've been hearing it'll make ArcIMS obsolete sometime in the future. SPRING is a state-of-the-art GIS and remote sensing image processing system with an object-oriented data model which provides for the integration of raster and vector data representations in a single environment. 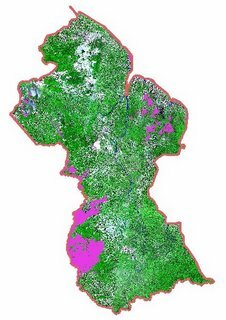 SPRING is a product of Brazil's National Institute for Space Research (INPE/DPI (Image Processing Division) with assistance from other natural resource agencies within Brazil. It supports both raster and vector data geometries and integration of remote sensing data into a GIS, with functions for image processing, digital terrain modelling, spatial analysis and data base query and manipulation. SPRING is free and may be downloaded from the INPE website; new versions with improvements and corrections are released periodically. 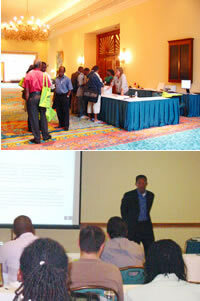 The URISA 2006 Caribbean GIS Conference is steadily en route to meeting/ exceeding expectation. A full summary will be posted soon, however it must be mentioned that the opening ceremony produced a pleasant surprise - from the Rt. Hon. Perry Christie, Prime Minister of the Bahamas, who spoke with commanding knowledge of the importance of GIS to the success of the Bahamas as a country, and for the Caribbean region as well. Speaking with only minor references to notes for facts and figures, the Prime Minister - a trained lawyer - eloquently "argued the case" for GIS and distinguished himself in an auditorium of GIS specialists and practitioners, and probably amongst his own peers in the region as well, with his confident and well-informed grasp of the technology and its application to planning and economic development. The historical record here, here and here should have hinted of this; nonetheless, a pleasant surprise Mr. Prime Minister. The URISA 2006 Caribbean GIS Conference had an excellent, well-organised start. There are lots of attendees (300 odd), and the pre-conference workshops were well attended; the one on Spatial Data Infrastructure (SDI) went well past its scheduled closing time of 5pm due to attendee-interest. The programme ahead has something of interest in several areas; Conservation, Urban Planning, Coastal Zone Management, Cadastre Management, Disaster Management, Modeling, etc. are probably expected areas of interest, but the schedule also includes presentations in Archaeology/ Forensics, Law Enforcement, Web GIS and Mobile GIS. What do you do; what do you do? A look back at the hinterland flooding in Suriname in May 2006. The Region needs better spatial data - and a region-wide initiative building on the public and private sector nodes that do exist, should be considered. Along with data the Region also needs a strongly-associated way(s) of swiftly and conveniently providing such data and related information to persons/ agencies in all parts of the Caribbean. It's the only way to leverage the available brain-trust for (i) planning and (ii) when time is of the essence; and to leverage the media in educating the public. Say 'Internet'? A simple example: 4SHORE Web provides data as well as maps of the Guyana Coastal Zone. Free. It's an always-on source, so academics, graduate students and specialists worldwide can do analysis of their own, on an area of great interest to the country. (What you can do, do.) Providing simple information (see map gallery below) in a convenient manner, especially in lieu of anything else, can be helpful, as some responders or potential responders may know very little of the affected area. 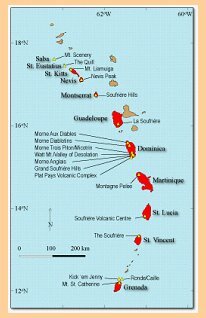 The Caribbean is a zone of hurricanes, earthquakes, volcanoes and floods. If the Caribbean stops at this list, it has overlooked another major threat to the small island states and the coast of Latin America; many researchers have proposed the theory of global warming from climate change which will lead to sea level rise. 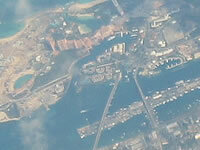 Sea level rise further increases our vulnerability and associated risks. Disaster planning and management is utilising Geographic Information System (GIS) by using its technology and application. Whether it’s preparing evacuation maps and zones of influence, to the cell phone messages of warnings within a certain radius, the use of GIS is expanding with the pace for improved planning to save lives. The compilation of websites for data and information provides a clear understanding on the strides made to use GIS for better planning and preparation in light of the recent heightened activities occurring in the Caribbean. Over the years, much research has been compiled and reports presented on these disasters. We will proceed first with volcanoes. Dr. Tatiana Delgado of the National SDI Commission of Cuba (en español: CIDERC) is studying the state of readiness of SDI (Spatial Data Infrastructure) of countries in Latin America & the Caribbean; i.e. the degree to which a country is prepared to deliver its geographical information in a community. Download the questionnaire to participate (instructions inside). The results could contribute to the enhancement of national SDIs in many countries. CaribbeanGIS highly recommends the Caribbean's biggest event for GIS: the URISA 2006 Caribbean GIS Conference - Shattering Barriers ... Building Bridges. It will run from Oct 29 - Nov 2, 2006 at the Atlantis Resort [ ], Bahamas. Previous events in Montego Bay (2002) and Bridgetown (2004) were informative, well-organised and fun, and the 230+ persons attending this year can expect the same. The Hon. Perry Christie, Prime Minister of The Bahamas will give the keynote address. 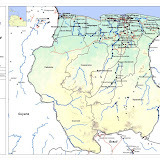 This is the new home of Caribbean GIS, the resource formerly located at CaribbeanGIS.com. It serves the GIS and wider community, particularly that of the Caribbean and surrounding areas. Technology (i.e. the application of) is a significant factor in development. The UN Economic & Social Council said this in more detail in 2004. In particular, meeting the MDGs [Millennium Development Goals for 2015] will require building a solid national science and technology base to enable the generation, use and diffusion of scientific and technological knowledge. Academia/government/industry partnerships are essential in building scientific and technological capabilities and fostering market-oriented policies and developments. Also essential is access to new and emerging technologies, which requires technology transfer, technical cooperation and building a scientific and technological capacity to participate in the development, mastery and adaptation of these technologies to local conditions. GIS is relatively new technology (e.g. Waldo Tobler in 1959, Roger Tomlinson in 1963 and Jack Dangermond in 1969 - snapshots by CASA UCL), and with its explosive growth in complexity, an emerging science. The countries of this region face unique circumstances and deficiencies when it comes to the adoption of new technologies/ solutions; and with GIS being powerful, its concepts and utility are not easy to grasp either. So, even with the successes it has certainly had in the region, GIS has not made the wide inroads into agriculture, disaster management, coastal zone management, health care, criminology, etc., that it could. CaribbeanGIS.org will be talking about policies, developments, successes and issues in GIS. We hope the new format suits you the viewer, and further encourages your participation for the region's benefit.